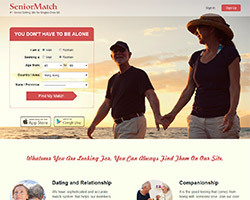 SeniorMatch.com is our top choice from more than 10 senior dating sites that we have tested and reviewed. It has been working as the #1 senior dating site for singles over 50 ever since 2001. Check the detailed reviews for SeniorMatch.com to find out the reason why it stands out from all other older dating sites. Eventually, SeniorMatch.com takes the No.1 position of our top 5 ranking senior dating sites list. It stands high here with reasons. Started in 2001, SeniorMatch is no doubt the pioneer of the niche dating sites that caters to mature singles over the age of 50. By leading in the area all the way through these years, Senior Match has accumulated a large number of mature single members who are trying to find their partners through this new tech method. And yes, there are of course a lot of success stories from their members that you can take a look on their site. Although the database of registered members on the site is not as large as the popular dating sites like Match.com etc.,But the quality of the members on site has been maintained on a high level. We finally find out the truth that all the registered profiles on their site are manually censored to get rid of the low quality profiles as well as some fake ones. Also, as a dating site that designed for mature singles only, SeniorMatch does not allow the members below the age of 30. With that said, all the profiles that under the age of 30 will be refused and deleted from their database. Unlike many other dating sites with endless questions and forms during registration, their registration process has been made easy for senior citizens. With just three simple steps to sign up, you will be able to get connected with other older singles like you. Once you are on their site, you can clearly see the specially designed factors which differentiate it from other general dating sites. The bigger font on the site makes it easier for seniors to read and also we have to mention the easy navigation. You can always find small but important designs like these which make the use of the site at ease for seniors. There are many features available on this site that allow you to get in touch with other single members. There are free winks that you can send out to members that you are interested in without being a paid member. You can also search and browse profiles for free. Create your personal blog on site, upload up to 26 photos to create your profile photo gallery for others to check. There is also senior forum that you can share ideas and opinions with other mature singles on different subjects. There is also dating game “Let’s meet” that plays magic between you and your possible matches. But to enjoy full features of the site, you need to upgrade to a gold member which is actually cost worthy. You can check the detailed membership cost in the “Membership Costs” section on this page. Considering that we may all have “senior moment”, the customer service on a senior dating site is also very important for members on site. Based on our test experience, this is something really impressing. We have ever tried to contact their customer service by email and we got their reply really fast like within 1 business day or even just a few hours. And they are really helpful to solve the questions and issues you may have with the site.